UP Bed 2019 Admit Card:- Candidates who have recently fill your UP B.Ed online form successfully before the last date 15th March 2019, Now they can eligible to access their UP JEE BEd Admit Card 2019. The Mahatma Jyotiba Phule University releases the UP B.Ed Admit card on 8th April. The UP B.Ed Exam 2019 conduct on 15th April. So Applicants can download the Uttar Pradesh Bed Hall Ticket 2019 before the official link will be closed. The Mahatma Jyotiba Phule University ready to conduct the Uttar Pradesh Pre Teacher Training Examination on 11th April 2019. Aspirants who have apply their application form successfully only they are eligible to download their UP JEE B.Ed Hall Ticket 2019. As per the latest details, The UP Bed Admit Cards will be release through online in April 1st week. So you can get their UP JEE BEd Admit Card 2019 via online process. You can take help to download the Admit Card through registration no and Date of birth. In Feb, The MJPRU release a notification for the UP JEE B.Ed. Candidates are invited in online mode through the site. For more details you can tuned here. Aspirants know that the UP Bed Admit Card 2019 contains the personal info about the examination like as applicant’s name, their roll no, application number, venue of the exam, photo & signature also. The MJPRU will release the UP JEE B.Ed Hall Ticket 2019 online. 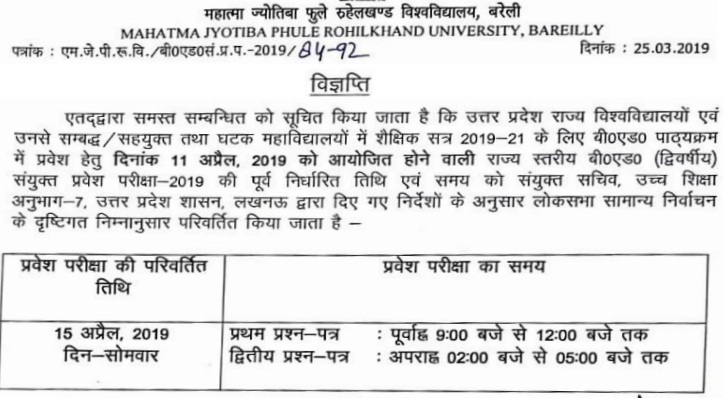 The Examination cell (MJPRU) of UP B.Ed announce the B.Ed Exam Date which will be conduct on 15th April 2019. Candidates start their exam preparation by which they can crack the exam and secure their name in the selection list. Click On the Download Admit Card on the below URL. Enter the USER ID Registration Number and Password. On Login Your Brief details will appear. Click on “Admit Card” Tab. Candidate needs to Click on “Click Here to Download Admit Card” tab to Download the Admit Card. Due to Loksabha Election, The MJPRU has been extended the UP B.Ed JEE Written Exam Date. Now the Exam will be conduct on 15th April 2019. The UP B.Ed JEE 2019 will be conducted 15 cities in Uttar Pradesh State. The Hall Ticket/ Admit Card will be released through online. Candidates must carefully preserve the admit card until the completion of the admission process. The UP JEE B.Ed is the Joint Entrance Exam Pre Teacher Education Test, Which is conduct yearly in the Uttar Pradesh State. Large no of applicants appear in this exam. Candidates can not sit in the Teacher Exam without JEE B.ed or D.El.Ed Score card. So If any candidate want to be a teacher in UP State than firstly they have require to admission in the UP B.Ed. The LU releases JEE B.Ed 2019 Application form this year. You can download your UP JEE B.Ed Admit Card 2019 through visiting the university home page. We have upload here a direct link after official declaration. The Examination will be Objective Type (MCQ). For each right Answer awarded 2 Marks. There will be Negative marking for each wrong answer 1/3 mark. Downloading of U.P. JEE B.Ed. 2019 admit card would begin on 8th April 2019 (from after Noon) and would be available till the test date. The link is available on www.upbed2019.in through their personal login details. Students can access and read the important information like details of their Examination Centre, Roll Number and important instructions from the Admit Cards. The Entrance Examination will be conducted in April. Paper I will start from 9.00 a.m. to 12.00 a.m.
Paper II will start from 2.00 p.m. to 5.00 p.m. Candidates have to report to Test Centre at 8:30 A.M. for the Paper I and at 01:30 P.M. for Paper II at the allotted Examination Centre only. The one copy (University Copy) of Admit Card is to be submitted for verification at the time of the test. At least one original (not photocopied or scanned copy) and valid (not expired) photo identification card (such as Driving License, Passport, PAN Card, Voter ID, Aadhaar UID) should also be presented for verification purpose. Mobile phones or any other electronic gadgets such as watches, calculators etc. are NOT ALLOWED inside the examination hall. The MJPRU will release the UP JEE BEd Admit Card 2019 soon on the official portal. Applicants also carry the User ID, DOB or Full name during the downloading of UP B.Ed Admit Card 2019. Students also bring the hall ticket for written examination. If any applicants have facing problem to download UP JEE BEd Hall Ticket then they can contact in board of comment us. Our experts will give you proper solution.